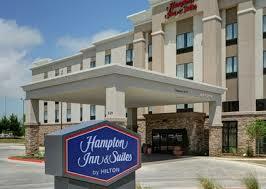 Experience the beauty of the Arbuckle Mountain range at the Hampton Inn & Suites Ardmore. Hidden from the highway yet convenient to everything you need in Ardmore, our hotel makes it easy to enjoy the area. Hop on the highway to reach restaurants and shopping, or take a back road to explore the parks and outdoor activities. Join other travelers in the bright and airy breakfast area for our free hot breakfast with favorites including waffles and hearty oatmeal with toppings. On your way to a meeting in Ardmore? Grab one of Hampton’s On the Run™ Breakfast Bags available Monday through Friday. After a day of adventure in the Arbuckle Mountains, relax in a clean and fresh Hampton bed® with free WiFi and your favorite shows on the 40-inch HDTV. Catch up on work with the lap desk in every room or in the business center with free WiFi. Wake up for a quick workout in the fitness center. Swim some laps in the heated indoor pool to unwind from a busy day!